The CitroCasa 8000 SB is a powerhouse among self-service juicers. 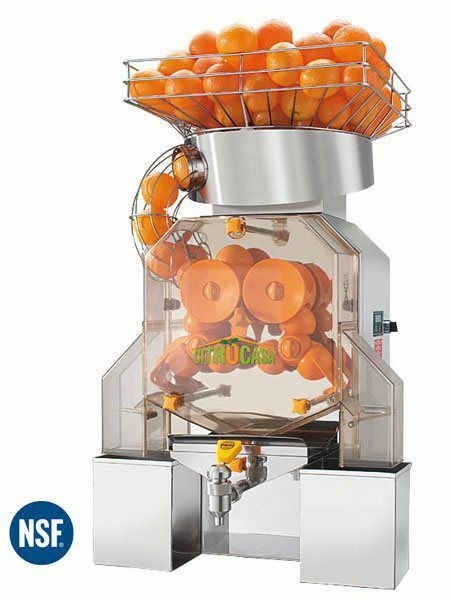 This workhorse presses 40 oranges per minute, for an average yeild of 2.7 liters per minute of fresh squeezed orange juice to boost your profits and your customer satisfaction. Because this is a high volume unit, we recommend either a bottom cart or counter top kit. Reduce your labor costs by adding the optional “ATS” (automatic pulp and seed removing system) upgrade. Check out the CitroCasa 8000 SB/ATS. 115V 60hz 8 amps. Equip with a standard 3-prong plug.